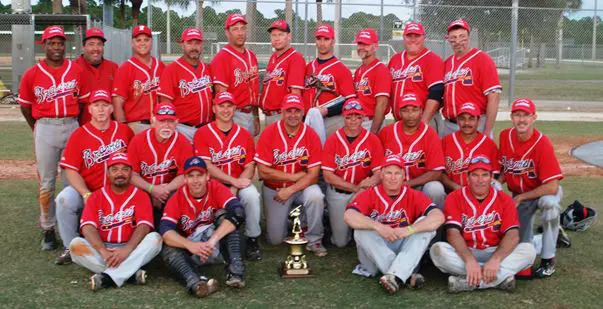 Jupiter, Fla., Nov. 17, 2012 — With one final, high, unhittable fastball, Dan Kopitzke gave the Raleigh Braves something they could always remember, and he gave manager Dave Halley a reason to briefly forget. Kopitzke struck out the final hitter of the game to earn his fourth win of the tournament, and put an exclamation point on the Braves 8-3 win over the Atlanta Twins in the 45 Central division title game. Braves players beamed with pride as they watched manager Dave Halley hoist the championship trophy after the game. It was a welcome respite from a battle that has consumed Halley’s life since July – his fight against non-hodgkin’s lymphoma. “These guys are like brothers,” said Halley, who was slated for his final chemotherapy treatment three days after the end of the Fall Classic. Fittingly, it was Kopitzke who was one of the final Braves players to share a post-game hug with the manager teammate after teammate thanked for the opportunity to play on such a dominant club, but more importantly, for being a great friend. The lefty, who runs a baseball training academy in Apex, NC, won four games during the tournament. The incredible effort included 10 innings of shutout ball during playoff victories over the D.C. Express and Albany Cubs, the second in relief, before a five-hit masterpiece in the final. Kopitzke was speaking of an offense that ran roughshod through its first six opponents and averaged nearly 16 runs per game. The Braves got a six-hit combined shutout between Jay Biesenthal and Kopitzke to beat Albany, 3-0. Then, after South Atlanta tied the game 3-3 in the top of the sixth, they got three hitless innings from Kopitzke and an offensive outburst to finally put away the pesky Twins. Both teams traded runs throughout the first six innings, with Raleigh’s Hector Diaz [2-for-3, two doubles] scoring twice on the back end of double steals and South Atlanta’s Joel Grier driving in a run in the second and scoring the game-tying run on a ground out in the sixth. That’s when the Braves’ explosive offense finally came to life and paved the way for Halley’s first championship. Dave Royek [2-for-2, double] and Kenny Glanville [2-for-4] scored to give Raleigh a 5-3 lead, before Chip Haver, Royek and Glanville had RBI singles in a decisive three-run seventh that put the game away. All that was left was one bit of unfinished business in the ninth. With two outs and holding a five-run lead, Kopitzke was all set to fulfill his role in a plan he and Halley had hatched beforehand. It was agreed, that in tribute to his friend, Kopitzke would provide Halley with the chance to close the game. Not surprisingly, for the final time of the 2012 Fall Classic, one of Halley’s teammates had his back.